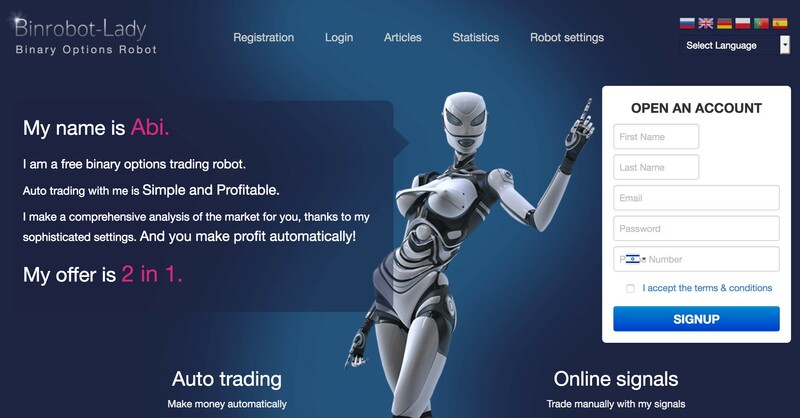 Binrobot-lady, The Best Free Binary Options Robot Yet! The bonuses section of our ratings is not applicable to Binrobot-lady with any bonuses users are eligible for provided by the robot’s compatible partner brokers and not the robot itself. For the software category, a strong score is based on easy usability and the robot’s functionality doing what it is intended to. A well put together product! Customer support gets a relatively weak rating due to an enquiry form providing the only channel of communication with the company behind the robot. Live chat or a telephone line would be a significant improvement. Finally, with users able to customise Binrobot-lady’s 6 indicators to build their own trading systems, this tool provides plenty of flexibility and choice and deserves a good rating here. Software-based automation has brought efficiencies to almost every industry over the past several years and the world of financial markets trading has been no different. The most time-consuming part of a trader’s job has always been conducting technical analysis – the process of predicting price movements of financial instruments based on cycles which repeat over time. This is achieved by applying mathematics-based formulas onto price charts to isolate which of these patterns are currently prevalent. There are many different ‘technical indicators’, that show these price cycles and traders devise trading systems that employ different combinations of those. Historical data shows which of these combinations have proven to be most accurate in different sets of circumstances. However, performing technical analysis takes time and doing so manually severely restricts the number of trading opportunities a trader is physically able to assess at any one time. Enter the robots! Trading robots are not of the mechanical variety but software-based. For a number of years now professional traders have been making use of software that automates technical analysis for them. When a trading robot’s trading system spots a pattern that seems to indicate a particular future price direction is likely, it sends a ‘signal’ to the trader. The trader then casts an eye over the technical analysis the robot has performed on their behalf and comes to a decision on whether or not they would like to confirm a trade based the advice of the signal received. Binary trading robots do exactly the same thing, with their software programmed to the specifics of binary options trading. There are now several robots available on the market that binary options traders can use to provide trade signals. 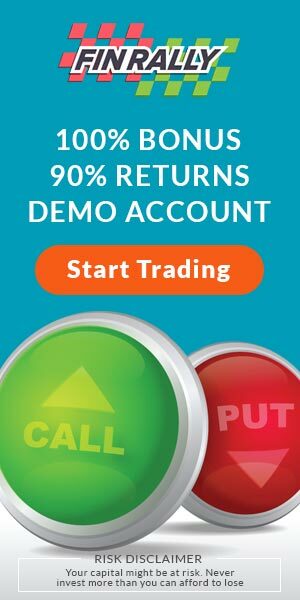 Most also have a setting that allows traders to give them authorisation to automatically place binary options trades if they meet certain pre-defined criteria. Less experienced traders who do not yet have the knowledge to accurately do their own technical analysis can let a binary options robot do it for them and experienced traders who can do their own analysis also benefit from the time using a robot saves. There isn’t a great deal of information available on the company behind Binrobot-lady but we do know it was established in 2014. Most trading robot software companies, like many other software companies, remain in the background with the product itself the focus. Because Binrobot-lady is free to use, the company has no financial transaction with users so company information is not really necessary. The trading robot’s software is nicely designed and users will have no difficulties in setting up an account and the settings they wish to use. Set-up is from Binrobot-lady’s website where, once a user account has been created, a trader must choose one or more of the binary options brokers the robot is compatible with to trade from. The robot needs an API-feed from the broker’s pricing charts to be able to work so has to be used with a partner broker that has provided this. Binrobot-lady is currently compatible with 6 different binary options brokers, all of whom are CySEC-regulated. Once a trader has opened a trading account with a broker, all of which require a minimum initial deposit of $250, they must configure the robot to the settings they wish to use to provide indicators. Three default trading systems are provided and users can also create their own by using any combination of the six different technical indicators the robot works with. Traders must also decide whether to use the robot in its autotrade or signals setting. In the case of autotrade, the robot will actually take binary options positions on behalf of the trader when it spots an opportunity that matches its trading system. The user will have set the investment stake the robot can place on any single trade and also how many trades can be placed over one session and the maximum loss for any one day incase things don’t go well. The robot claims a very strong success ratio but it is not perfect so can still have days which involve losing streaks. The other setting is for Binrobot-lady to provide ‘signals’ but not to actually place any trades. In this setting, the robot will simply inform the trader of the trade opportunity. The final decision and action of actually placing the trade is then left to the trader. We recommend using trading robots in this way. A trader should always make the final call on a trade and not rely 100% on any automated system. Professional traders always further assess signals trading robots provide before deciding which to act upon. Binrobot-lady doesn’t come in app form and is intended to be used predominantly via a desktop. However, the website is built with a mobile-responsive design so the website can be relatively comfortably used from a smartphone or tablet device. As already mentioned, Binrobot-lady has three of the most commonly employed trading systems that make use of its six indicators pre-set. Users can choose from the Classic System, Martingale System and Fibonacci System and can also set different systems for different assets they trade if they feel different systems are best applied to different assets. Alternatively, the robot also has 6 popular technical indicators that users can put together in their own customised combinations to create alternative trading systems. When a trading system is set up using combinations of these indicators, a signal is only given if all agree on their predicted price movement trajectory. There are no fees or charges attached to using Binrobot-lady. The robot’s business model is that the company earns a commission when users open a trading account with a partner broker. This is paid by the broker so the cost to trade, with or without the robot’s assistance, is the same for the trader. Users can refer to our binary options brokers review section when making a choice as each broker offers slightly different conditions in terms of their trading platforms, minimum investment stakes, range of tradable assets, banking options etc. It’s also possible for traders to set up accounts with more than one broker simultaneously. Many binary options brokers, including some of the six that Binrobot-Lady’s trading robot software is compatible with offer traders bonus programmes as an additional incentive to trade with them. These tend to take the form of cash top-ups applied to deposits paid into trading accounts but bonuses such as ‘risk free trades’, where losing binary options trades are refunded, and loyalty points schemes based on trading turnover are also common. 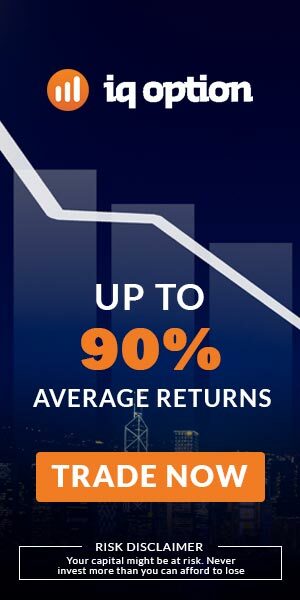 However, these bonuses are provided by the brokers themselves rather than Binrobot-Lady so should form part of the research conducted by traders when they are choosing which broker to work with. 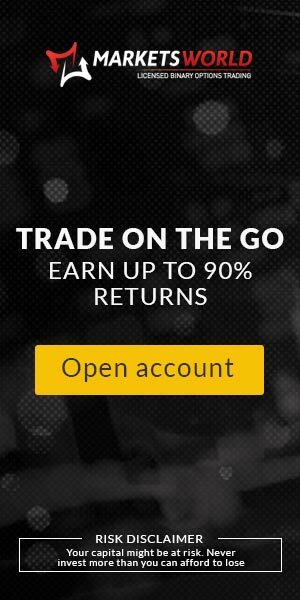 Most outline bonuses available on their website and traders can also refer to our broker reviews where bonus details are provided. One thing to note is that bonuses often come with conditions attached to trade turnover that must be met before subsequent withdrawals can be made from an account. Traders should make sure they are aware of those and happy to accept them before agreeing to receive a bonus. Often bonuses are applied automatically and traders should actively decline them if they do not wish to be tied to their conditions. Binrobot-Lady does not process any payments directly with all financial transactions going through the partner broker(s) selected by the trader to trade through. This is another characteristic that users should research when deciding upon a broker as there are variations in aspects such as which payment processing channels are supported by different brokers. Charges applied to withdrawals also vary between brokers as do minimum withdrawal values. Setting up and using Binrobot-Lady is straightforward and traders should encounter little need for customer support. 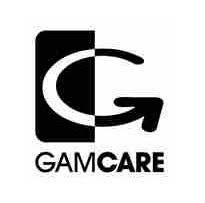 However, for any issues or questions encountered there is an enquiry form provided. A live chat customer support channel is, however, something that would be a welcome addition here and speed up the response rate to situations requiring customer support. Users are able to see an historic record of the success of signals provided by Binrobot-Lady. This can help them come to a decision on which signals to act on based on the success ratio of the available trading systems and indicators as applied to different tradable assets. Binrobot-Lady is a very useful tool for binary options traders used correctly. As with any trading robot or signals system, users should consider the trading robot as a support tool and not a magic wand. It is a nice piece of software that is very simple to set up and use that can really make using technical analysis in trading a more efficient process. Traders should not blindly make trades based solely on signals and should always do their own additional analysis. As long as these simple rules are kept to, Binrobot-Lady brings plenty of added value to binary options traders. No. All Binrobot-Lady really does is automate technical analysis for traders. Unless a trader sets the robot to auto-trade on their behalf, which we don’t recommend, the final call on any trade must be taken by the user. As such, traders must accept responsibility for any trades made on the basis of signals provided by the robot, winning or losing. The robot provides trade signals on the basis of established technical indicators commonly used by traders. What is the Success Rate of Signals Provided by Binrobot-Lady? The company states that signals have a success ratio of 87%, though this cannot be objectively verified. Is Binrobot-Lady Expensive to Use? No, the trading robot is free to use for traders. Partner brokers pay the company a commission when a user opens a trading account with them but this does not change the trading costs in any way for the user. How accurate are the signals provided by Binrobot-Lady?